Contrast media administration can lead to acute deterioration in renal function particularly in patients with pre-existing chronic kidney disease. This prospective, randomized controlled open-label parallel group study was undertaken at Nizam's Institute of Medical Sciences, Hyderabad, from June to December 2015. A total of 95 patients were included, of which 35 received n-acetylcysteine (NAC) + normal saline (NS), 30 patients received allopurinol (ALL) + NS, and 30 patients received placebo. In our study, the overall incidence of CIN was 24%. 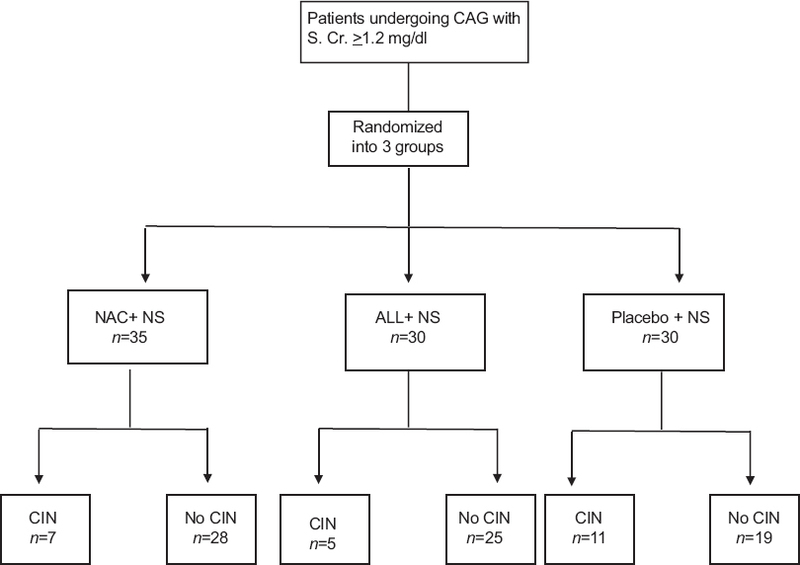 Incidence of CIN in NAC + NS, ALL + NS, and placebo group were 20%, 16%, and 36%, respectively. The major finding of this study was there was no significant difference between NAC and allopurinol in the prevention of contrast nephropathy. However, only allopurinol was superior to placebo. In our study, hyperuricemia and baseline serum creatinine were the only risk factors associated with CIN. Acute kidney injury (AKI) is a frequent and complex disease. It is not clearly defined whether its duration is related to adverse outcomes. We determined the effect of AKI resolution time on patient's clinical outcomes. A prospective cohort of hospitalized patients with AKI by AKI network (AKIN) creatinine criteria was included. Variables for prognosis and follow-up were analyzed. One hundred and thirteen patients were included in the study. Seventy-seven (68.1%) were males, mean age 55 years (range, 16–76 years), and 48 (42.5%) were diabetic. The most common cause of AKI was sepsis (31%). AKI resolution time ≤2 days and >2 days was seen in 47 (41.6%) and 66 (58.4%) of the cases, respectively. AKI resolution time >2 days was common in older patients (66.24 ± 17.6 year vs. 47.16 ± 12.32 year, P = 0.004), with the use of mechanical ventilation (27% vs. 4%, P = 0.02) and vasopressors (41% vs. 11%, P ≤ 0.01); it was associated with increased mortality (47% vs. 4%, P ≤ 0.01), and a discharge estimated glomerular filtration rate (eGFR) <60 ml/min/1.73 m2 (52% vs. 2%, P = 0.01), than in patients with resolution time ≤2 days. Survival rate was significantly worse in patients with a resolution time >2 days. By multivariate logistic step-wise regression analysis, AKI >2days, vasopressor use, and AKIN stage 2–3 were independently associated with higher mortality. AKI >2 days and vasopressor utilization were independently associated to an eGFR <60 ml/min/1.73 m2 at the time of discharge. We conclude that AKI resolution time >2 days is linked to adverse clinical outcomes. 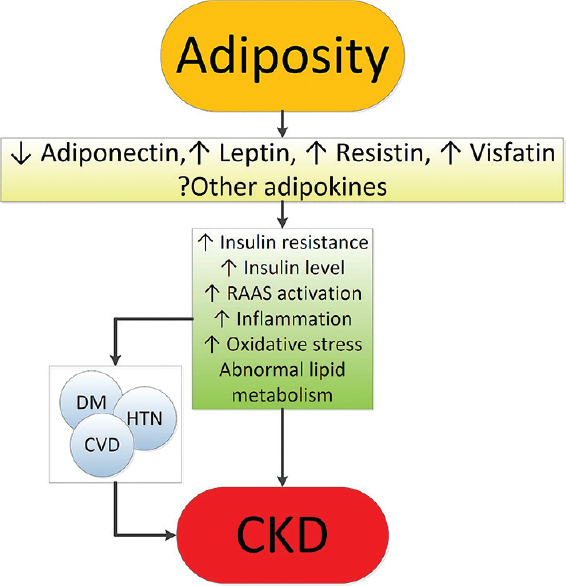 Reduced T3 and free T4, elevated thyroid stimulating hormone, and hyporesponsiveness to thyrotropin releasing hormone raise questions about the presence of hypothyroidism in chronic kidney disease (CKD) and raise the possibility of benefit from thyroxine supplementation. A prospective cohort study was conducted on 73 nondiabetic CKD cases. Hypothyroid patients were started on levothyroxine and were reviewed after 3 and 6 months. The mean age of study population was 42.3 ± 16.8 years. Of the total population, 32 (43.8%) cases had hypothyroidism, among whom 2 (2.7%) had overt hypothyroidism and 30 (41.1%) had subclinical hypothyroidism. Prevalence of hypothyroidism increased with increasing severity of CKD. There were 1 (3.1%) case with hypothyroidism in stage 3b, 8 (25%) cases in stage 4, and 23 (71.9%) cases in stage 5. The mean estimated glomerular filtration rate (ml/min/1.73 m2) at baseline was 13.7 ± 8.9 which increased to 17.5 ± 6.8 and 22.4 ± 9.3 after 3 and 6 months of thyroid hormone replacement therapy (THRT), respectively (P < 0.001). Hypothyroidism is commonly associated with nondiabetic CKD and its prevalence increases with declining renal function. THRT significantly improves renal function in nondiabetic CKD with hypothyroidism. Anti-glomerular basement (anti-GBM) disease is an uncommon disorder with a bimodal age of presentation. Patients presenting with dialysis-dependent renal failure have poor renal outcomes. There is limited data regarding the clinical presentation and outcomes of anti-GBM disease from India. We conducted this prospective study to analyze the clinical presentation and outcomes of anti-GBM disease at a large tertiary care hospital in North India over 1½ years. Subjects with a biopsy proven anti-GBM disease (light microscopic examination showing crescents and immunofluorescence examination showing linear deposition of IgG) with or without positive anti-GBM antibodies in serum were included in the study and followed-up for at least 12 months. All the patients were treated with steroids, cyclophosphamide, and plasma exchange. A total of 17 patients (nine males) were included. The mean age at presentation was 39.11 ± 16.58 (range 11–72) years. Twelve patients (70%) presented with rapidly progressive glomerulonephritis (RPGN), 4 (23.5%) presented with Goodpasture syndrome, while 1 (5.8%) had nephritic syndrome, 7 (41%) were hypertensive, and 14 (82.3%) required dialysis at the time of presentation. Four patients (23.5%) had associated anti-neutrophil cytoplasmic antibody positivity (anti-myeloperoxidase antibodies in all). 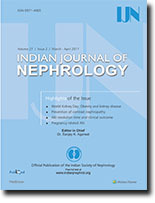 Fourteen (87.5%) patients had crescentic glomerulonephritis, while 5 (31.25%) showed necrotizing (n = 4) or granulomatous (n = 1) in the vasculitis. Of 16 patients who received treatment, four (23.25%) achieved complete remission. In this single-center study, the majority of anti-GBM disease patients presented with RPGN and had crescentic glomerulonephritis on biopsy with poor treatment outcome. 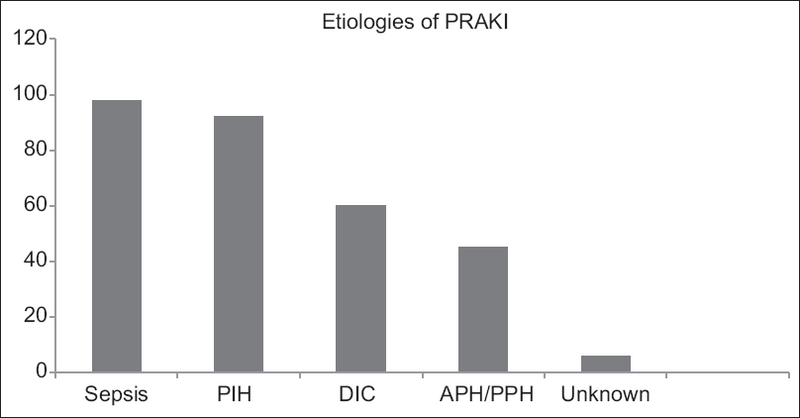 Pregnancy-related acute kidney injury (PRAKI) contributes to 3–7% of overall acute kidney injury (AKI) cases in Indian subcontinent. The aim of this study was to determine the outcomes of PRAKI and risk factors associated with renal injury and maternal mortality. One hundred and sixty-five patients with PRAKI, seen at M. S. Ramaiah Medical College between 2005 and 2014, were included in this, observational study. AKI was analyzed in terms of maximal stage of renal injury attained as per Risk, Injury, Failure, Loss of function, and End-stage renal disease (RIFLE) criteria. Outcomes included requirement for renal replacement therapy (RRT), maternal, and fetal mortality. Incidence of PRAKI was 1.56%, and the mean age of the study population was 25 years. Fifty percent of the patients were diagnosed with PRAKI during their first pregnancy. PRAKI was observed most commonly in the postpartum period (60%), followed by third trimester (32%); as per RIFLE criteria, failure was seen in 36% and injury in 34%. Thirty percent of cases required RRT. Sepsis (59%), pre-eclampsia, and eclampsia (56%) were the leading causes of PRAKI, while sepsis was the leading cause of maternal mortality. Maternal and fetal mortality were 20% and 22%, respectively. In univariate analysis, shock, hemorrhage requiring transfusion of >5 units packed red blood cells, oliguria, and “Loss” category of RIFLE were significantly associated with mortality. Majority of the patients (57%) required Intensive Care Unit care with a mean duration of admission at 7.3 days, and 75% was diagnosed with AKI at the time of admission. We report the lowest incidence of PRAKI in contemporary Indian literature. PRAKI was associated with high maternal and fetal mortality, with sepsis being the leading cause. No association was noted between mortality and initial stages of RIFLE criteria. Although percutaneous renal biopsy remains the preferred method, there are several scenarios where transjugular approach is more suitable. We hereby describe our technique of transjugular renal biopsy (TJRB) and evaluate its safety and efficacy. We retrospectively collected data regarding indication for the transjugular route of biopsy, its complications, clinical and laboratory data, and adequacy of samples from patients' records. TJRB was performed when the patients were at a high risk for bleeding from percutaneous renal biopsy. Tissue samples were assessed by a pathologist for adequacy. All patients were followed up with ultrasonographic scan 3 h after the procedure and on day 3. Nine patients (age 41.5 ± 15.4 years; 8 men) underwent 9 TJRB procedures. The procedure was technically successful in all patients. Six patients (66.67%) had a platelet count of <50,000/mcL, 2 (33.3%) had an elevated International Normalized Ratio of more than 1.4, and 1 had both. 3.2 ± 0.4 cores were obtained, with median (range) number of glomeruli being ten (7–11). Adequate renal tissue sample was obtained in all the patients. 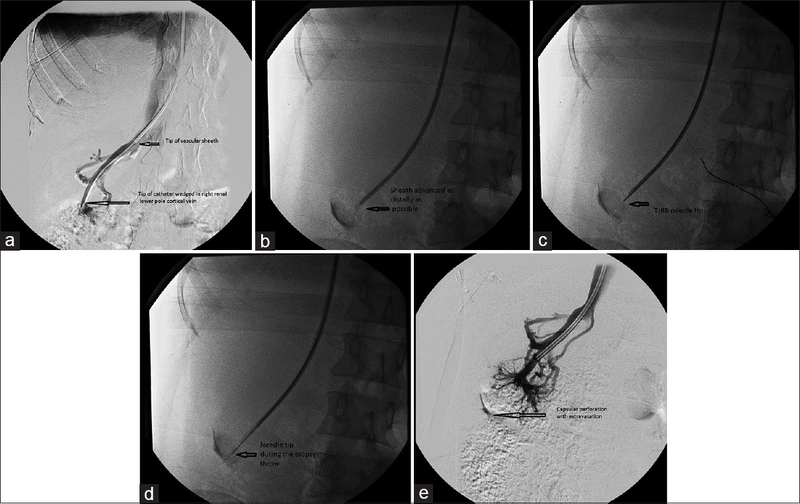 Though capsular perforation developed in 5 patients, none had major complication requiring management (endovascular treatment or blood transfusion). TJRB is a safe and effective in patients with contraindications to percutaneous biopsy. In clinical practice, serum creatinine-based predicting equations and Gates protocol based on gamma camera imaging of kidneys after injection of Tc99m-diethylenetriaminepentaacetic acid (DTPA) are commonly used to assess glomerular filtration rate (GFR). Comparison of these methods, especially the chronic kidney disease-epidemiology collaboration (CKD-EPI) equation with gold standard method of assessment of GFR by plasma clearance of Tc-99mDTPA is not well-studied in Indian population. We conducted this study to compare GFR estimation by gamma camera-based Gates protocol and serum creatinine-based predicting equations with GFR measured by plasma clearance of Tc-99mDTPA. One hundred and five patients (65 male and 40 female) underwent Tc-99m DTPA renal scan followed by withdrawal of venous blood samples at 2, 3, and 4 h as per predefined protocol. Gates method GFR (GFRs) was assessed using standard protocol. GFR by plasma sampling (GFRp) was calculated by slope-intercept method with provision for corrections. Estimated GFR was calculated by Cockroft-Gault formula, four variable modification of diet in renal disease (MDRD) equation, and CKD-EPI equation (GFRCG, GFRMDRD, GFRCKD-EPI, respectively). GFR measured by gold standard method (GFRp) was compared with that estimated by other methods by calculating correlation coefficient, bias, precision, and accuracy. GFR estimated by all three estimating equations correlated better than GFRs with GFRp. For estimating GFRp, GFRCKD-EPI had highest correlation with GFRp with least bias and highest precision. Gamma camera-based Gates protocol was the least precise and least accurate method for estimating GFRp. To conclude, all three estimating equations based on serum creatinine are superior to Tc-99m DTPA scintigraphy for estimating GFR; CKD-EPI equation being the most accurate and precise. We present a case of sudden allograft dysfunction 11 months after renal transplantation which presented as severe peripheral and allograft eosinophilia and was managed as a case of an acute cellular rejection with significant interstitial graft eosinophilic infiltration. Patient had partial response to antirejection therapy and eventually ended up in a chronic allograft dysfunction. Acyclovir is a commonly used antiviral drug. Acute kidney injury (AKI) due to intratubular crystal precipitation and interstitial nephritis is well known. Here we present a case of acyclovir induced AKI in a 61 year old male with herpes zoster, which presented like thrombotic microangiopathy with acute interstitial nephritis. This is the first case report on acyclovir causing thrombotic microaniopathy with partial improvement in renal function after plasmapharesis. A 57-year-old man on dialysis presented with fever due to Pseudomonas septicemia. Workup revealed very high triglycerides and serum ferritin levels. A bone marrow examination showed hemophagocytosis. A diagnosis of hemophagocytic lymphohistiocytosis (HLH) was made and steroids were started. He was put on automated peritoneal dialysis. Patients' condition continued to deteriorate and he succumbed to his illness. This case illustrates the development of HLH secondary to infections which are increasingly being recognized in the literature. Often this diagnosis is missed as it becomes difficult to differentiate between sepsis and HLH. The presence of high ferritin, hypertriglyceridemia, and hemophagocytosis in the bone marrow confirms the diagnosis. Hypertension is common in hemolytic uremic syndrome (HUS) and often difficult to control. Local renin-angiotensin activation is believed to be an important part of thrombotic microangiopathy, leading to a vicious cycle of progressive renal injury and intractable hypertension. This has been demonstrated in vitro via enhanced tissue factor expression on glomerular endothelial cells which is enhanced by angiotensin II. We report two pediatric cases of atypical HUS with severe refractory malignant hypertension, in which we targeted the renin-angiotensin system by using intravenous (IV) enalaprilat, oral aliskiren, and oral enalapril with quick and dramatic response of blood pressure. Both drugs, aliskiren and IV enalaprilat, were effective in controlling hypertension refractory to multiple antihypertensive medications. These appear to be promising alternatives in the treatment of severe atypical HUS-induced hypertension and hypertensive emergency. 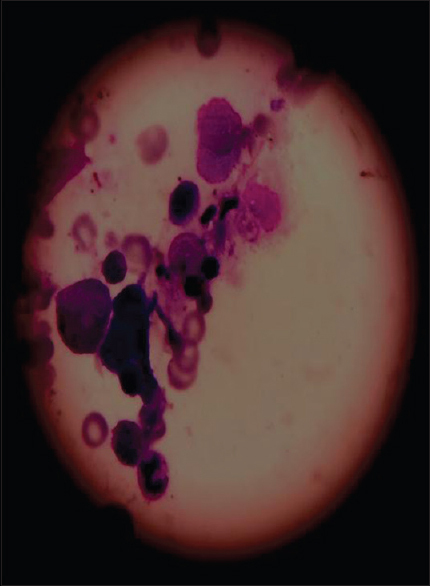 A 32-year-old male presented with advanced renal failure and nephrotic proteinuria due to lambda light chain multiple myeloma. 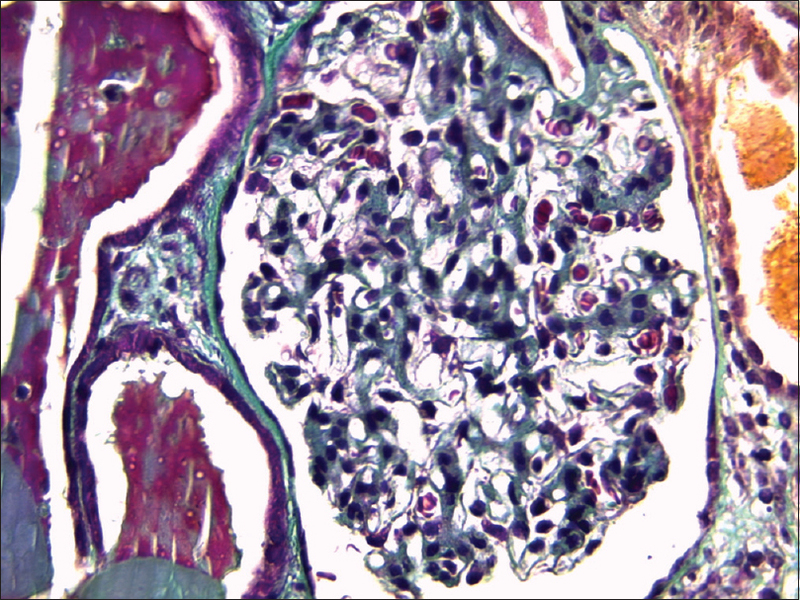 Renal biopsy showed a proliferative glomerulonephritis with isolated C3 deposits. Renal recovery was obtained after chemotherapy and autologous stem cell transplant. 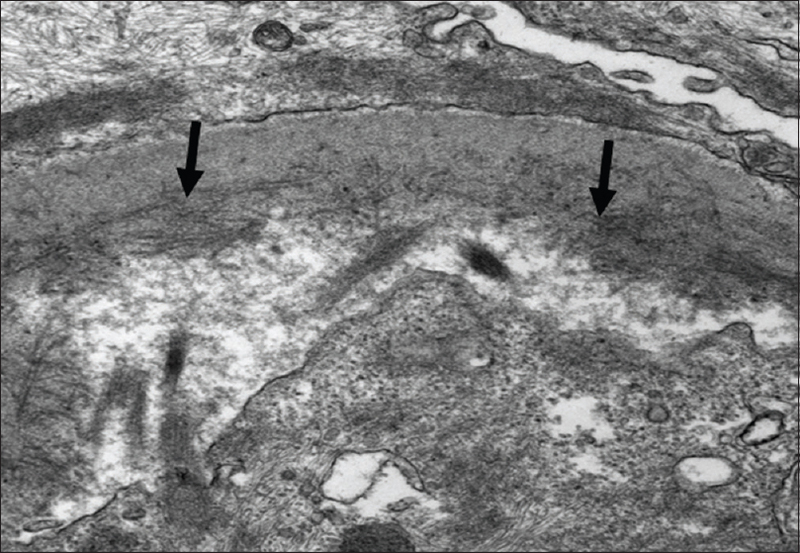 We review previously described cases of C3 glomerulopathy associated with monoclonal gammopathy. Immunosuppression predisposes to a variety of infections, some of which occur at unusual sites. Of all the forms of mucormycosis, involvement of the intestines is rare. High degree of suspicion along with the use of invasive procedures can facilitate the diagnosis of these infections. We report a rare case of gastrointestinal Mucor in a patient with nephrotic syndrome. 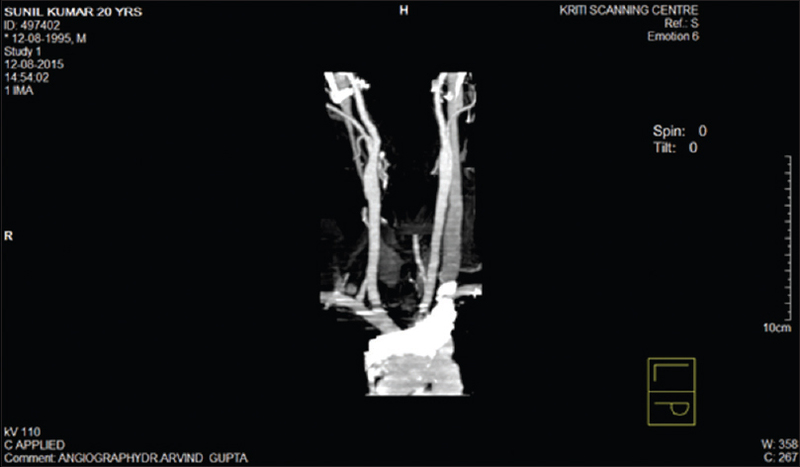 Internal jugular vein (IJV) catheterization has become the preferred approach for temporary vascular access for hemodialysis. However, complications such as internal carotid artery puncture, vessel erosion, thrombosis, and infection may occur. We report a case of brachial plexus palsy due to compression by right subclavian artery pseudoaneurysm as a result of IJV catheterization in a patient who was under maintenance hemodialysis. Scrub typhus is a rickettsial infection commonly seen in Asia. The clinical presentation ranges from nonspecific febrile illness to potentially fatal multiorgan involvement such as liver, kidney, or lung. Central nervous system involvement is uncommon. We report a 45-year-old female renal transplant recipient who presented with fever, headache, meningeal signs, graft dysfunction, and eschar. IgM antibodies against Orientia tsutsugamushi were positive by enzyme-linked immunosorbent assay. 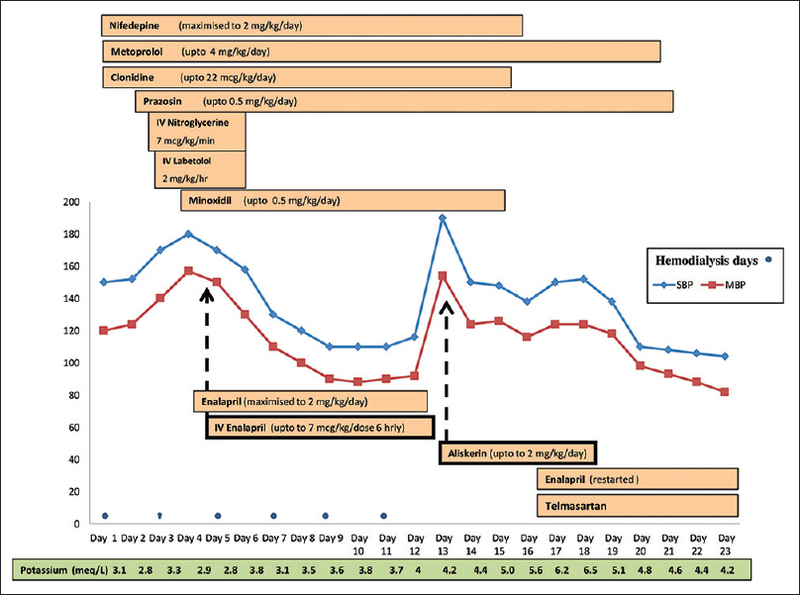 Despite oral doxycycline therapy for 5 days, she did not improve but responded well to intravenous azithromycin. To the best of our knowledge, scrub typhus as a cause of meningitis in a renal transplant recipient has not been reported so far. 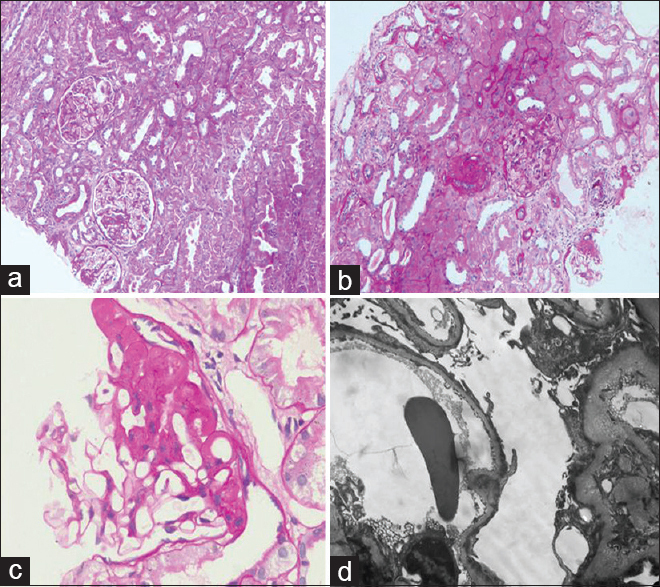 Recurrence of focal segmental glomerulosclerosis (FSGS) is common after kidney transplantation. Plasmapheresis (PP) is considered to be the most effective treatment; however, results are variable and relapse is common after stopping plasmapheresis. Here, we report an unusual case of recurrent FSGS, who achieved complete remission with angiotensin receptor blocker therapy. Fibrillary glomerulonephritis (FGN) is a rare primary glomerular disease that commonly presents clinically with hypertension, proteinuria, microscopic hematuria, and varying degree of renal insufficiency. 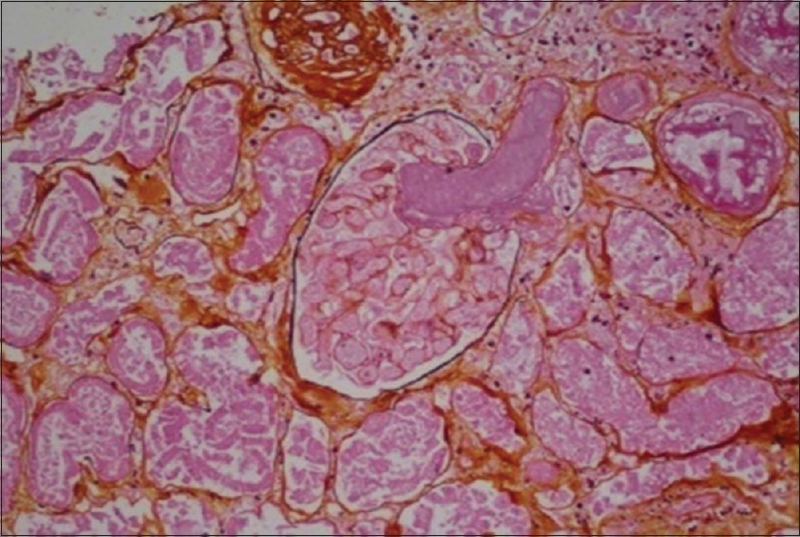 Histologically, FGN can present with different patterns of glomerular injury, more commonly mesangioproliferative, membranoproliferative, and membranous nephropathy. While crescent formation has been described in some kidney biopsy series of FGN, crescentic glomerulonephritis pattern of glomerular injury has been rarely described. Optimal therapy and outcomes in FGN presenting with crescentic GN is not currently known. We report an adult patient who presented with massive proteinuria and severe renal failure. The kidney biopsy revealed crescentic FGN (C-FGN). The patient remained dialysis dependent despite immunosuppressive therapy. We also briefly review FGN, and the few reported cases of C-FGN that presented as rapidly progressive or advanced renal failure in the literature. Snake bite is mainly an occupational hazard and causes serious health problems in rural India. Acute kidney injury (AKI) occurs in 5-30% cases. Renal pathologic findings include acute tubular necrosis, cortical necrosis, interstitial nephritis, glomerulonephritis, and vasculitis. 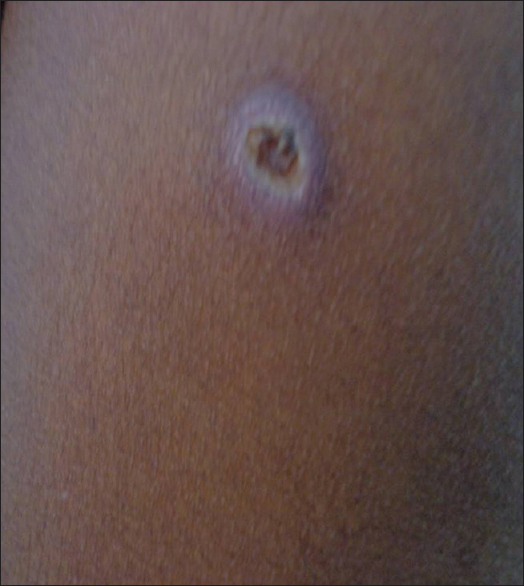 Thrombotic microangiopathy (TMA) occurrence after a snake bite is reported rarely. Here, we present two patients who developed TMA after viper bite treated with hemodialysis and plasmapheresis. 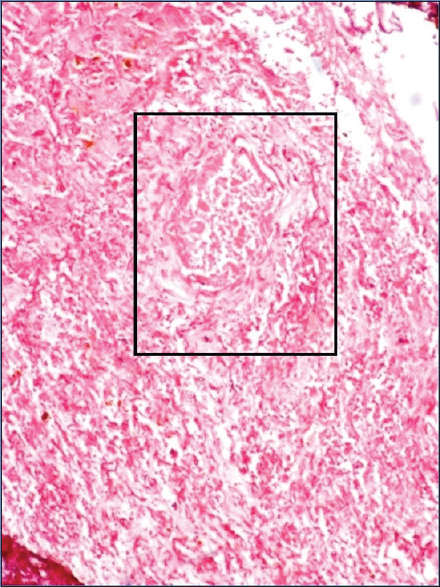 Renal biopsy showed fibrin thrombi in glomeruli and arterioles with cortical necrosis. One patient progressed to end-stage renal disease and other was lost to follow-up. 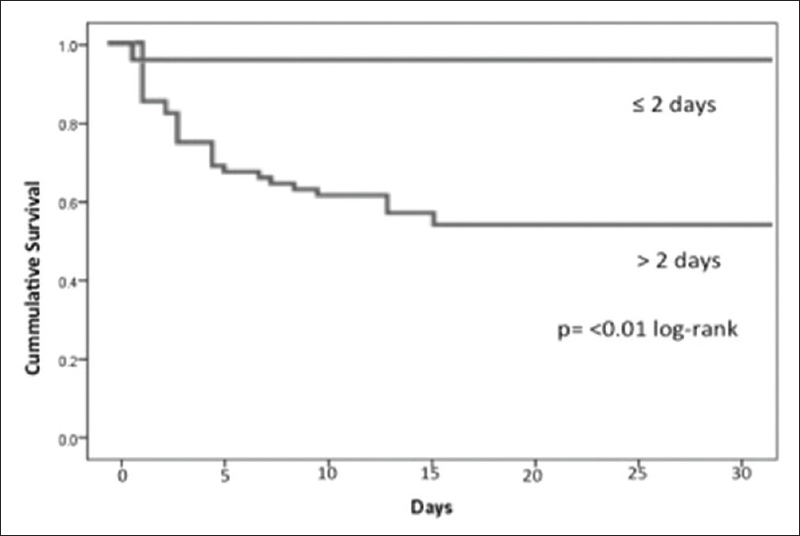 TMA should be considered as a possible pathogenesis of AKI after snake bite. The role of plasma exchanges in snake bite TMA is yet to be defined.